V0884 Her is a cataclysmic system, with an accreting orbiting white dwarf. The white dwarf is magnetic, with its spin period equal to the orbital period, and no accreting disc: this is a polar or AM Her type system. 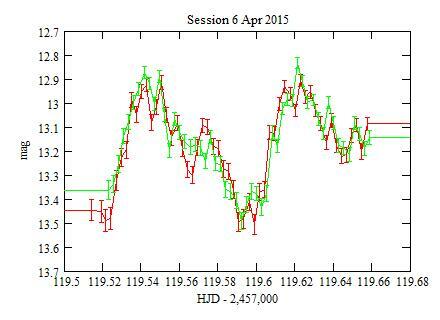 V884 Her has an orbital/spin period of 1.884 hr and is one of the brightest polars (in 2015). The observations were carried out with a 203 mm f/6.3 Schmidt-Cassegrain telescope, a filter wheel and a SBIG ST7E camera (KAF401E CCD, mostly red sensitive). The observations for the 2 sessions of February were done through a Clear filter. For the other sessions, two polarized filters were used alternatively, one with its axis roughtly parallel to the RA axis (the "X polarization filter"), the other roughtly parallel to the DEC axis (the "Y polarization filter"). The exposure durations were 60s long, whatever the filter. 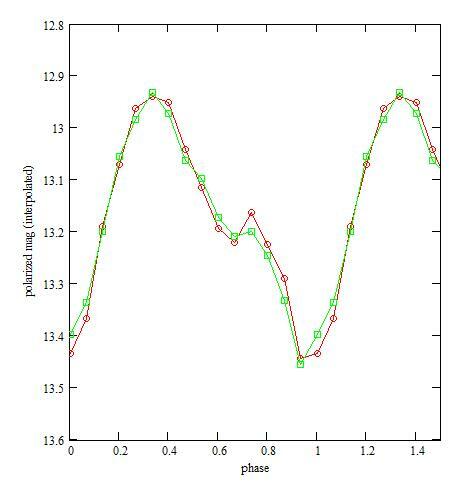 The comparison star is 14CMC180220.8+180726, with an Rc magnitude of 12.194, computed from the CMC14 r' magnitude and the 2MASS magnitudes, owing to the transformations formula of Bilir et al (2008) and Smith et al (2002). The Rc magnitude is used as the unfiltered magnitude because of the mostly red sensitive CCD. It is also used for the polarization measurements. where the first ± is the average statistical uncertainty (computed as the quadratic sum of the statistical uncertainties on the check star and the comparison star) and the second ± is the standard deviation. 149 useful images were acquired through the Clear filter (in 2 sessions), 234 through the X polarization filter, 229 through the Y polarization filter, alternatively (in 4 sessions). Red: through the X polarization filter, Green: through the Y polarization filter. The error bars are the 1-sigma statistical uncertainties. 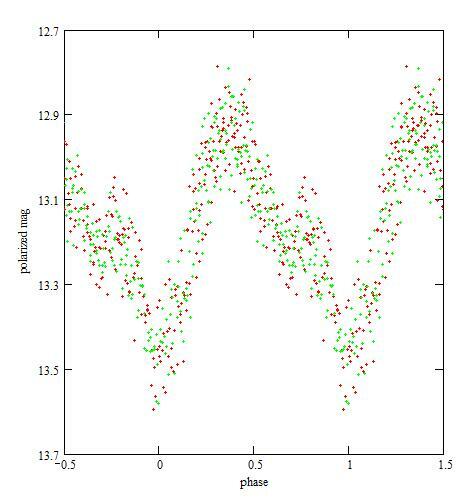 Red: X polarization, Green: Y polarization. The object is brighter in the X polarization before the minimum, and dimmer after. Between the T of the ephemeris of Greiner et al (1998) and mine there are 99979.38 orbital/spin rotations, not an integer number. 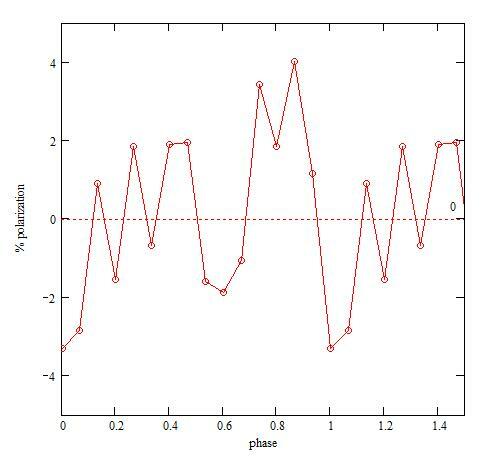 The 0.38 dephasing is much too large to be explained by the uncertainty on the period. The period may be changing and fairly fast. It would be interesting to have measurements between 1993 and 2015 to see how this is changing. 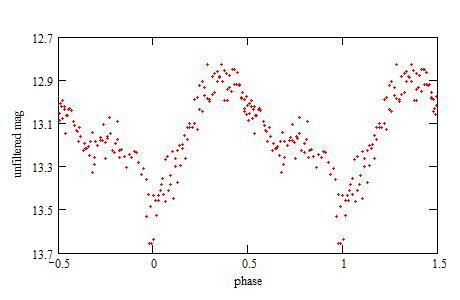 The linear polarization appears to reach ± 4% around the orbital minima, a fairly common occurence for polars. Howing to the brightness, the polarization may be detetected even with an amateur setup. Greiner J., Remillard R.A., and Motch C. (1998) A&A 336 191. Smith J.A et al (2002) AJ 123 2121.
. Follow-up observations and analysis.